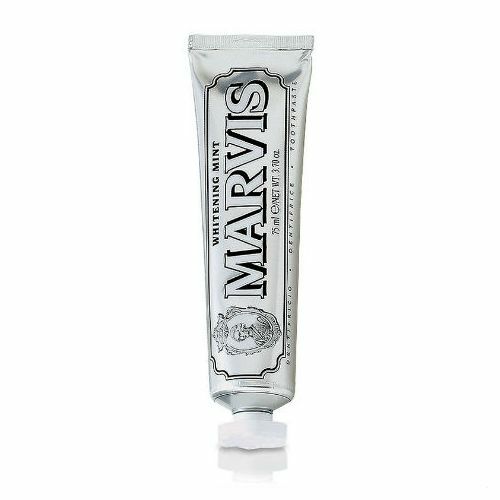 Packing a fresh and powerful punch, the Marvis Classic Strong Mint Toothpaste steps in to support your daily dental care. 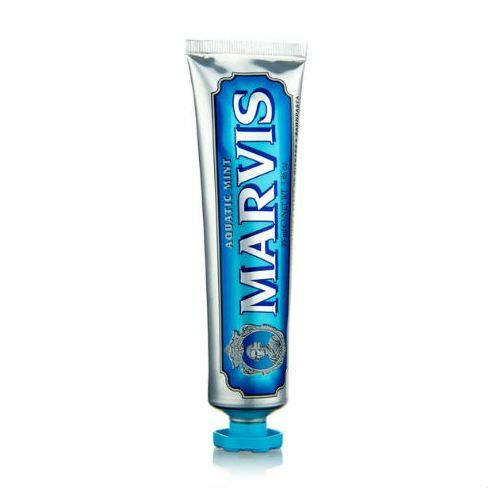 With its delectable peppermint flavouring, this rich toothpaste glides easily over teeth to effectively remove plaque and grime. Added protection effectively prevents tooth decay and tartar with a formula that is gentle enough for use multiple times a day. Developed by a leading brand with years of experience within the dental industry, this targeted toothpaste slips in as a hardworking alternative to your existing brand and can be used in conjunction with mouthwash to bring you one step closer to that sparkling, white smile. Glycerin, Aluminum Hydroxide, Aqua, Silica, Aroma (Flavour), Cellulose Gum, Titanium Dioxide, Sodium Lauryl Sulfate, Sodium Saccharin, Sodium Fluoride, Citric Acid, Sodium Citrate, Limonene, Eugenol. Use a pea-sized amount twice daily.